All prices below include the Book(s) and shipping costs. Please select your country and shipping option below before clicking the “Buy Now” button. Thank you. —> Contact us for other quantities and shipping options. * Book orders to Europe either ship from Germany or the UK with media mail and are unsigned. If you prefer to pay in € to our German Bank Account click here. If you prefer a personally signed and dedicated copy of the manual sent from the US to you, then please select the “One Book Incl. Priority Mail to All Other Countries $49.99 or Two Books $59.99” option. Thank you very much! ** The two books ship from the US and are dedicated and signed upon request. Please specify if you want the second book unsigned, signed, or dedicated to a specific person (give name). For additional payments, go to paypal and send the amount to our account martin@singles2couples.org. Thank you. The English! 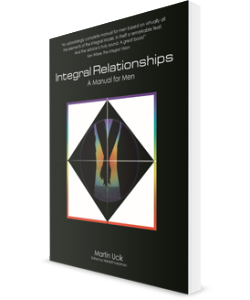 Kindle version of Integral Relationships: A Manual for Men is now available on Amazon in the US/Canada, Germany, UK, France, Spain and Italy. www.amazon.com/dp/B004BSH3WA (US) www.amazon.de/dp/B004BSH3WA (Germany) www.amazon.co.uk/dp/B004BSH3WA (UK) www.amazon.fr/dp/B004BSH3WA (France) www.amazon.es/dp/B004BSH3WA (Spain) www.amazon.it/dp/B004BSH3WA (Italy) For questions or other payment options call 707-566-2106 or fill out the contact form. The Evolutionary Human 23% off US List ($12.95). 94 pages, 4 x 6″ (10 x 15 cm).